Catering to the world's most fortunate, Ferrari built the America and subsequent SuperAmerica models to special order throughout the 1950s. 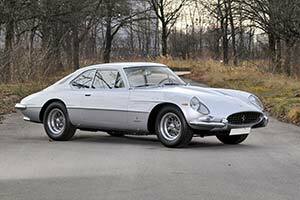 Except for the earliest examples these luxurious Grand Tourers were clothed by Pinin Farina and all of them were powered by the Aurelio Lampredi designed 'long block' V12 engine. The last Lampredi engined 410 SuperAmerica was completed in November of 1959. Ferrari started the decade fresh with the 400 SuperAmerica launched in Brussels in January. Clothed by Pininfarina with an understated Cabriolet body, the Italian manufacturer's latest Grand Tourer sported an all new chassis and engine. For the first time the SuperAmerica used a derivative of the 'short block' V12 engine, penned by Gioacchino Colombo back in 1946. Back then it displaced just 1.5 litre but over the years it had grown in size considerably. At four litres, the Tipo 163 version used in the 400 SuperAmerica had a swept-volume almost three times the size of the original. The type number used raised some questions as it did not relate to the unitary displacement (330 cc) as had become a Ferrari tradition. Ferrari did not release performance figures immediately and some even suggested that the unusual type number was an indication of the horsepower available. Although Ferrari never explained the type name, the 400 was most likely a reference to the engine's displacement. Eventually Ferrari stated the engine produced 340 bhp, which probably was a tat too optimistic as well. Like the engine, the chassis was also derived from the smaller 250 GT model. The biggest change was a wheelbase increase of just 20 mm to create a little more interior space. The lineage of the chassis could also be traced back to those used for the earliest Ferraris. The steel ladder frame was constructed of two oval-tube members with several cross-braces to increase rigidity. The front suspension was by double wishbones and coil springs while at the rear a live-axle and semi-elliptic leaf springs were fitted. Ferrari did break with tradition by replacing the tried and trusted drum brakes with Dunlop-sourced discs. The four-speed gearbox was also very similar to the 250 GT's. It did feature stronger gears to cope with the additional power and torque produced by the bigger engine.